Joel's Jottings: I cheered, like I did in 1983. I cheered, like I did in 1983. Twenty eight years ago, as a very young teenager, always hanging around with the neighbourhood’s big guys, I huddled around a small black and white TV set with them, watching live the 1983 Cricket World Cup Finals. It was India against the mighty – at that time, considered almighty - West Indies! Can India ever beat these giants of cricket? The giants who had won in 1975 and 1979, the only two times the World Cup was held? And the giants who, in 1983, were now gunning for a hat trick? Yes. It is important to mention all the names of these titans. They were, indeed, a formidable team of that time. I had never known any foreign team’s full batting order as I did the West Indies’ then. Mohinder Amarnath and Madan Lal together, literally ran a truck through the West Indies team taking six wickets, three each. They left two wickets to BS Sandhu, and one each to Roger Binny and Kapil Dev. And, thus the seemingly big and invincible Caribbean team was completely demolished even before they could reach 140 while chasing a target of 183 that India had set. The giants had fallen! And at the fall of the last wicket, of Michael Holding to Mohinder Amarnath, we had erupted into such loud applause of joy that we almost woke up the entire neighbourhood. What a match!! What a night! When India became the world champions! Now again, yesterday, as a grown up adult, when Dhoni hit that final six, making India win the World Cup again, I was unable to contain myself, and screamed with the same delight that I had had 28 years ago. Despite that sudden deadly silence that hung in the air when Sehwag and Sachin left the field, Gautam Gambhir and MS Dhoni brought back cheers to Indians the world over. And the climax was heart-pounding. Today, one of the friends who had watched that 1983 finals on TV, at the same time, wrote on my facebook wall, saying, ‘Isn’t it surprising that from 14 to 41, the digits of my age have reversed, but my excitement has not diminished’? I had to just say, touché! Just like the black and white memory I have, of Kapil Dev lifting the Prudential World Cup in 1983, I will now carry in my mind, a colourful picture of this World Cup 2011, of Dhoni and Sachin being carried on the shoulders of their team members. And will I, or will those millions around the world, ever forget the tears of joy on the faces of Yuvraj, Harbhajan and Sachin? Will I, or will those millions around the world ever forget the final six that Dhoni swung into the crowds? It is indeed pure magic. Joy unspeakable. What a day for us, the cricket-crazy Indians, across the globe that all the years of waiting for a second World Cup are finally over. We had to still struggle, with the three time champions, Australia, with one time champion, Pakistan, and with one time champion, Sri Lanka. But we came through - no, zoomed through - into a final brilliant explosion of sheer delight. The roar of the crowds on the television, and the roar of the horde of friends in my living room, are still reverberating in my ears, and might take quite a while to subside. To Lorraiane and her cheerleaders, for cheering so well that my landlord is now threatening to evict me. To Aldrin Bogi, whose comment I used here. To my daughters, Jennifer and Janelle, who are still dazed at the behavior of 'adults'. Joel, thats very nicely put. I think most of us have the same story to tell when we compare both the matches. Lets not forget that in 2011, India defeated 4 world cup winners - WI, AUS, PAK, SL. But I still appreciate your jottings!! Yes Anand. I agree. But in 1983, no one expected India to win. West Indies were the ultimate team who simply terrified the world. India faught them valiantly silencing those who thought India will just concede! Now, India's form is good. cricket popularity is at the peak. Our team's composition was top rate. Everyone expected India to win. The moment india won dad said that he watched the 1983 WC with you on a black & white tv... and he said that you didnt cherish the moment to the fullest( may be you were not THAT cricket crazy then :P ).. so this is the time uncle.. cherish the moment and lets celebrate it together ( in different countries though :D ).. I personally regard 1983 triumph as the Greatest ever!!! I mean defeating Australia, England & WI in those times was indeed incredible!!! And to think of the fact that India had only won 6 ODIs (3 of them against SL, 1 against East Africa, only 2 against Eng was of any note) till then. 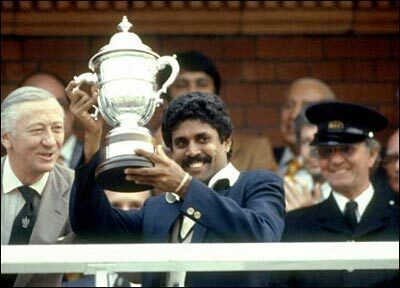 India rose as a Cricketing Nation at WC 1983!!! 2011 was also awesome. This maybe the Greatest ODI team along with another one which won the B&H World Championships in Australia in 1984-1985!!! Thanks Mr. Joel for taking me into the memory lane!! !